Slayer were one of the most distinctive, influential, and extreme thrash metal bands of the 1980s. Their graphic lyrics dealt with everything from death and dismemberment to war and the horrors of hell. Their full-throttle velocity, wildly chaotic guitar solos, and powerful musical chops painted an effectively chilling sonic background for their obsessive chronicling of the dark side; this correspondence helped Slayer's music hold up arguably better than the remaining Big Three '80s thrash outfits (Metallica, Megadeth, Anthrax). Naturally, Slayer stirred up quite a bit of controversy over the years, with rumors flying about Satanism and Nazism that only added to their mystique. Over the years, Slayer put out some high-quality albums, including one undisputed classic (Reign in Blood), and saw the numbers of naysayers and detractors shrinking as their impact on the growing death metal movement was gradually and respectfully acknowledged. 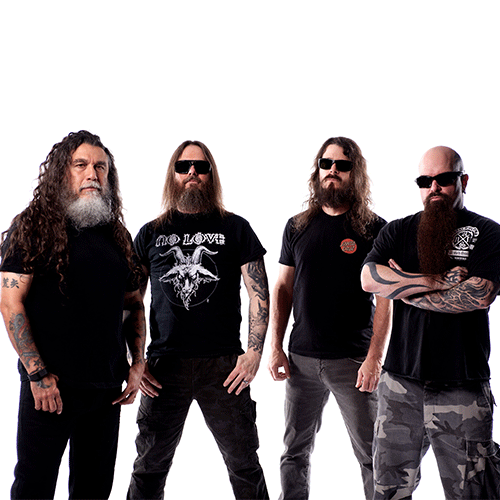 Slayer survived with arguably the most vitality and the least compromise of any pre-Nirvana metal band, and their intensity inspired similar responses from their devoted fans.